You amaze me how you can make something so beautiful with all of that detail and it not take much concentration:) It is gorgeous! Well, I guess we had the rain for so long here and now you are getting it. Things are pretty dry around my nest but it is supposed to rain a little today! Have a blessed day my friend and perhaps you will get a peek at those baby owls! HUGS! Oh how exciting -- I'd LOVE to be able to see some barn owls. It's interesting that they'll nest in those boxes. Love your pretty scarf too! I have a stuffed animal that looks like a baby barn owl. They are the cutest. That would be so neat to see owls! I love the colors in the scarf and the F&F pattern - simple and elegant. My daughter loves the zombies books - I haven't read them yet, so maybe that'll be in the queue. 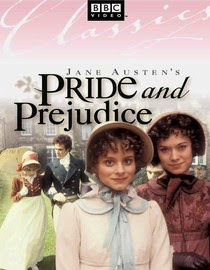 I've also never seen the P&P tv series...might have to check that out! No news here. wish I had more to tell you. LOL. That scarf you are working on is going to be gorgeous! I'm finally back online! Phew! Sometimes no news is good news, right? We desperately need rain here. It's so dry and brown. There were supposed to be thundershowers on Sunday, but they never happened. It's been warm for a few days now... wonder how long it will last. Love the scarf. You know the feather and fan pattern is my favourite - because I can do it! I have some pink bamboo yarn in my stash to make one for me. I seem to have made them for everyone else but not myself. Very nice post about Cory! Thank you for the birthday card!!! Nothing wrong with watching your favortie movies. That is so exciting about the baby owls. I sure hope we get owls soon at Grass Valley. Beautiful shawl. I love the colors. My root canal is tomorrow at 9:00. I can't wait until it is done! Oug.